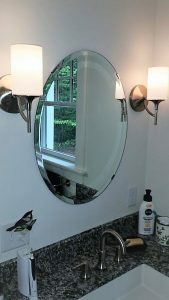 Mirrors for your bathroom, exercise room, formal dining room, or wherever you choose, we can provide you with the highest quality mirror available. Rather a flat mirror or fabricated with the elegant beveled edges, Beckett Glass can provide mirror to meet your specifications, or you can contract us to handle the measuring, fabricating and installation for your home project. Additionally, as a shop service, we also install mirrors in your wood frames and can include backing and hanging hardware for your own work of art. Check out some examples by going to our gallery. Commercial mirror work also available for your business, school or industrial location. These include mirror walls for gyms and dance studios. Convex detection mirrors for your security needs at work. As well as dressing room mirrors, security mirrors and accent mirrors to fit any decor.